The organ came to the church in 1908, but its earlier history is unclear. It is housed in a pretty wooden case which stands behind the choir stalls on the south side. It has one manual and ten stops. 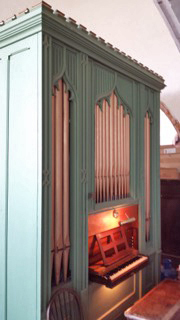 It makes a very attractive sound in the building, which has a warm acoustic, and is an ideal instrument both for accompanying the services and for playing organ music of all periods. Judging by the size of the choir stalls, the choir has numbered a good many singers in the past. At present there are 7 adult singers, so there is plenty of room for more! If you enjoy singing, why not give it a try? 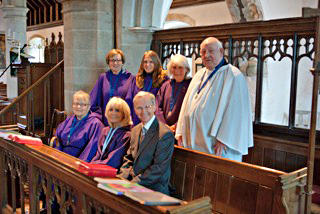 We are a friendly bunch and would welcome new singers at any time. No experience is necessary. Each month we meet for one choir practice and currently sing at two or three services. From time to time the church hosts concerts by visiting musicians. 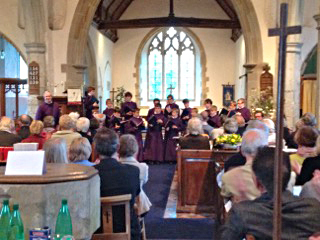 A recent highlight was the visit of the Choristers of Canterbury Cathedral, directed by Dr David Flood. The church was full and the music, which ranged across the centuries, was thoroughly enjoyed by all those present. How lovely to see such young people raising their voices with such skill and dedication.